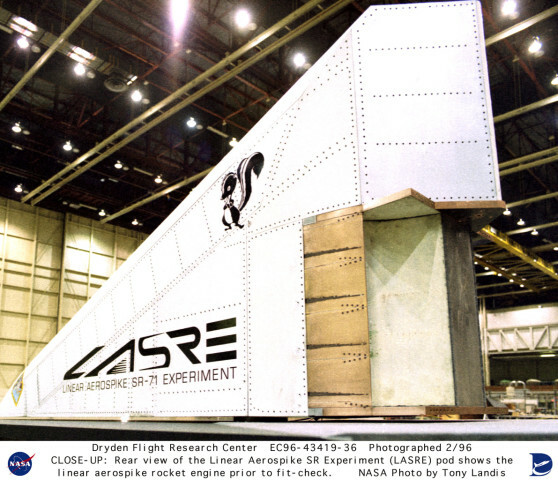 Description: This rear view of the Linear Aerospike SR Experiment (LASRE) pod shows the business end of the linear aerospike rocket engine prior to the experiment's fit-check on Feb. 15, 1996, at Lockheed Martin Skunkworks in Palmdale, California. One of the differences between linear aerospike and traditional rocket engines is that the linear aerospike utilizes the airflow around the engine to form the outer "nozzle." There is no bell-shaped nozzle as is commonly seen on most rocket engines. The engine is made of a high strength copper alloy called NARloy-Z. The white curved ramps next to the copper area pictured act as the inner half of the engine's "nozzle." There are four thrusters (copper area) on each side of the engine for a total of eight which combine the fuel, oxidizer, and ignition source for the engine. Keywords: SR-71; LASRE; Linear Aerospike SR Experiment; pod; Lockheed Martin Skunkworks; X-33; Reusable Launch Vehicle; NARloy-Z; engine flight data; Dryden Flight Research Center; aerospike; LASRE; linear aerospike rocket engine; Linear Aerospike SR-71 Experiment.